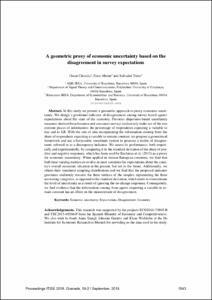 Claveria, O., Monte, E., Torra Porras, S. A geometric proxy of economic uncertainty based on the disagreement in survey expectations. A: International Conference on Time Series and Forecasting. "ITISE 2018: International Conference on Time Series and Forecasting: proceedings of papers: 19-21 September 2018: Granada (Spain)". 2018, p. 1543-1553. Disagreement, Economic uncertainty, Expectations, Geometry.